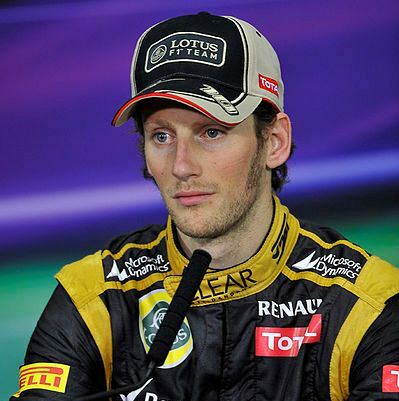 Home > F1 > Belgium GP: Is Romain Grosjean’s penalty fair? Rookie driver Romain Grosjean was responsible for causing a multi-car pileup at the first corner of Belgium GP. The Lotus driver started the race from 4th row on the grid on P8, alongside Lewis Hamilton. As the red lights went off, he moved left to get ahead of Lewis Hamilton and as the corner approached, he moved further left trying to squeeze ahead of the Brit. Clearly misjudging the braking and width of his car, Grosjean ended up colliding with the former world champion and it soon spiraled into 4-car pile. When the dust settled 4 drivers – Romain Grosjean, Lewis Hamilton, Fernando Alonso & Sergio Perez were out of the race. The later duo had started their race from P4 & P5. Fernando Alonso was badly shaken due after the crash and it took few nervous moments before he got out of the car. Some reports suggest that due to the probably a small fire started in his cockpit and the fire-extinguisher had gone off right on his face. While doctors were dealing with an inmobile Alonso in the Ferrari, a furious Hamilton jumped out of his car and walked towards Grosjean to exchange few pleasantries. Happiness in Sauber’s pit thanks to an amazing Saturday qualifying was shortlived as Sergio Perez’s car sustained damages at the first corner, while his teammate Maldonado narrowly escaped the mayhem and continued his drive (only to crash into Timo Glock later in the race). Thankfully no one was seriously injured. Race footage clearly showed that it was Romain Grosjean’s fault. After the race, the FIA officials gave Grosjean one race ban and a fine of €50,000. “The stewards regard this incident as an extremely serious breach of the regulations which had the potential to cause injury to others,” said a statement released by the FIA. “The stewards note the team conceded the action of the driver was an extremely serious mistake and an error of judgement. Neither the team nor the driver made any submission in mitigation of penalty.” Meaning both Romain and Lotus have accepted the decision and are not going to fight it. However, the fine may prove to be too steep for a rookie, unless the team decides to pay it off. Reacting to the decision Romain said, “I honestly thought I was ahead of him and there was enough room for both the cars; I didn’t try to deliberately squeeze him or anything like that.” Though Romain apologized to the drivers and their fans, no one’s too impressed with him at this point of him. The most shocking part about the whole incident was a statement in FIA’s decision that read, “It eliminated leading championship contenders from the race.” Does that mean that had he collided with HRT and Marussia drivers, he won’t have faced such a severe punishment? Shouldn’t all drivers and teams treated equally? What do you think? However, don’t forget that a driver’s reputation also goes a long way in determining the punishment. Romain Grosjean has crashed 7 times in 12 races. I have time & again pointed out that he’s a talented driver but his inexperience will get better off him and in the 2012 season his biggest learning curve will be to learn from his experienced teammate Kimi Raikkonen, and to stop making unforced errors. Now the biggest question at this point of time is, who will be Kimi’s teammate in the next race? Who do think will replace Grosjean at Monza?